This weekend ended the shooting of the romantic comedy Summer with the Gentleman in Central Bohemian Zduchovice. The script for the film about the desire for freedom, late love and hope was written by Jaromír Hanzlík, who fulfilled his dream. The main character of Arthur created for himself. The director of the film was given to Adam Adam. "It was a great adventure, it was very nervous and it was very difficult," said Jaromír Hanzlík. For all that time, extreme heat was taking place. "It was really demanding, there was no place to hide, people were exhausted. But the crew and the actors all worked with a really high effort and effort, and I thank them very much. "In addition to the extreme weather, everything was good. "Awesome actors were those who even took the small one-day rolls, meeting them very pleasant. We were also lucky to find ourselves in the village of Zduchovice, the locals welcomed us here very favorably and they cheered us ... "
Even if he did not turn, Jaromír Hanzlík was looking over the shoulder of an experienced director, Adam Adam. 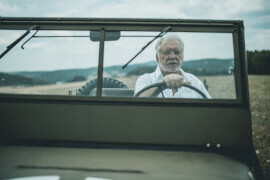 He has dozens of successful TV shows, productions, films and TV series and Jaromír Hanzlík met many years ago with the production of the series Sanitka and Lucky Pojišťovna. This time, however, he directed a feature film for the first time. "Can you imagine the most difficult combination for the director's work, as with an actor who has such an important actor's past, is a screenwriter of a filmed film and with me co-productions? Jaromir is also a person with a definite opinion, with a very concrete vision of what he wrote ... So frankly, this was probably the most demanding directorial work for me, "the director explained. Still, both are cooperative. "When the writer writes the script, he has his own idea when the director realizes it, so the idea is never the same. But it is nice when the two ideas intersect somewhere. And when it comes to a situation that is not so compatible, it is beautiful when the director and the author can agree. And I think I did it with Jirka Adamce. Either we have come to a compromise, or convinced one another of our truth. But I think the feeling of the film felt the same, "added Jaromír Hanzlík. Both of them are waiting for the work in the cutting room to send the film in the spring of next year to cinemas. And they are both looking forward. "I think we've done everything so that we can work in peacekeeping," said Jiří Adamec. "We will go there with a taste of what we have shot, we will give it a rhythm, a music of mood, and then we will send it to the audience for which we did it," added Jaromír Hanzlík. Romantic comedy Summer with the gentleman is especially for women. "But I think that if the women take their partners to the cinema, then they will find something for themselves. We want the film to entertain, delight, improve the mood to soothe the soul, "said the author of the screenplay and the lead role he made famous in the 70s of comedies Summer and Cowboy, to which he refers only partially to the name of Summer and the Gentleman, this is not a continuation. In the smaller roles, a whole host of Czech actor names such as Tereza Kostková, Petra Jungmanová, Yvetta Blanarovičová, Dana Batulkova, Pavel Soukup, Arnošt Goldflam, Zdeněk Dušek, Zdeněk Žák, Ivana Chýlková, Miroslav Etzler, Jan Censky, Jana Bouskova, Jan Vlasak other.